How to Swap two numbers in Java ?. How to Swap two numbers in Java without using third variable ?. In the first program we will swap two numbers with the use of third variable called as temp. It is generally a temporary local variable which can store value of a number for sometime and assign it to a different variable. 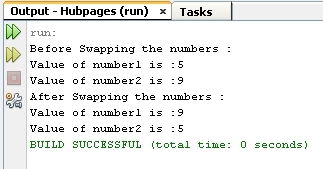 The code to swap two numbers by using third variable is written in swap method in below program. In the swap method our both the numbers i.e number1 and number2 are passed as arguments. In the swap method a temp variable is created to which number1 value is assigned to store it for sometime, so that it can assign it to number2 which will help us in performing swapping of two numbers.Meanwhile, number2 value is directly assigned to number1.